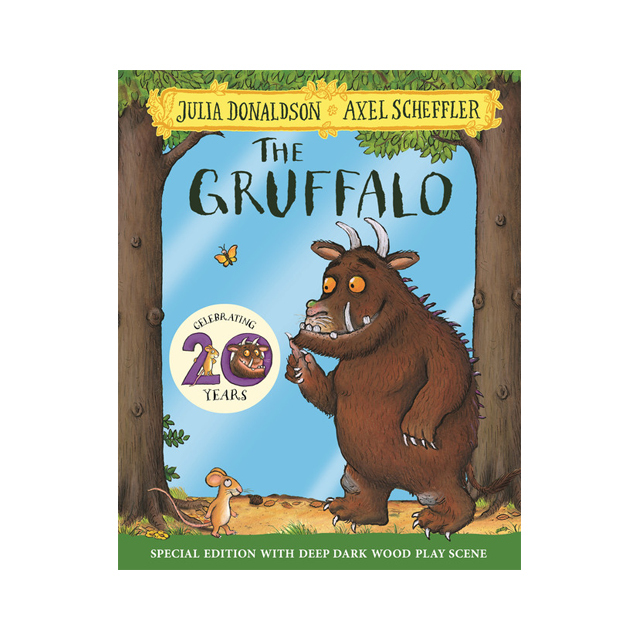 Celebrate 20 years of the modern classic The Gruffalo with this special anniversary edition of the story, featuring a wrap-around play scene and press-out characters for an interactive reading experience, a Gruffalo quiz, song lyrics, and much more! A mouse took a stroll through the deep dark wood. A fox saw the mouse and the mouse looked good. Walk further into the deep dark wood, and discover what happens when a quick-witted mouse comes face to face with a fox, an owl, a snake…and a hungry Gruffalo! Julia Donaldson and Axel Scheffler's The Gruffalo has become a best-selling phenomenon around the world. This award-winning rhyming story of a mouse and a monster has found its way into the hearts and bedtimes of an entire generation of children over the past 20 years, and will undoubtedly continue to enchant children for years and years to come. No home should be without The Gruffalo!